We are V.E.R.S and this is our home page! Please feel free to comment and suggest. We would LOVE to hear from you and see if there is anything that we can improve on! We really like sewing and making clothes and hope you like them too. We hope to continue doing this and help others as well, one stitch at a time! This week, I learned a lot about waste and how I can try to prevent so much of it. However the thing that stuck with me the most was that I realized that when you are done with something, a shirt, for example, there are unlimited possibilities to what that shirt can become. Even ordinary things that you outgrow or stop using can be turned into something that really means a lot to someone else. When a garment or anyother possesion means something to it's owner, they are less likely to waste it and more likely to try and make something new and different out of it. I guess you could say that our scarf was made on accident, but it adds a nice touch the the dress. When we were working in the hall, I (erica) spilled the cochineal dye. We had seen the other group's really great shirt, (of moped up dye) so we decided to try it. 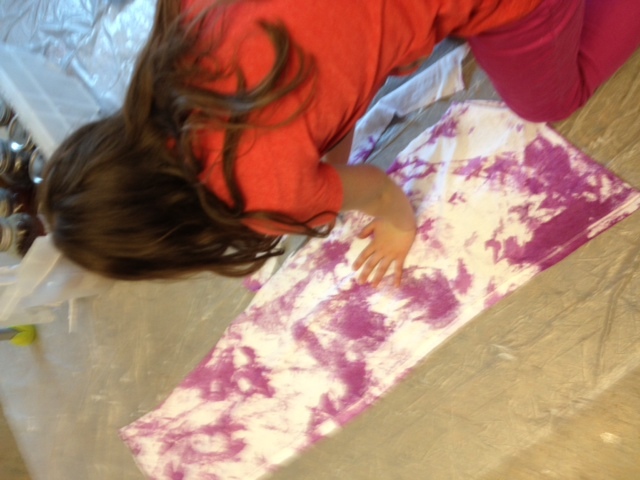 The shirt however, didn't mop up all of the dye so we had to use some paper towels too. Suprisingly it looked AMAZING! When we got back to the classroom Sophie added some fringe and hemmed it. This is the dress after we dyed it, before adding any accesories. We painted large and small circles in cochineal (purple) and filled them with eggplant (grey). The dye we used was 100% natural and made from lunch scraps from the cafeteria. Here is our entire group standing next to our un-dyed dress. From left to right: Sophie, Vy-Anh, Erica, Rachel. This is a picture of what we have been learning about! Erica is holding our belt. We ripped old undershirts into really thin strips and tied them together. Then we sewed them to a longer, thicker strip of lace. After that Vy-Anh hand sewed the seam so it looked neater. The belt is detatchable so you don't have to wear it with the dress. This is a dress we made from other garments before we dyed it. The neckline is made from the collar of a dress shirt and the sleeves are taken from another lace shirt.